Mind if I rest my trunk for a minute? 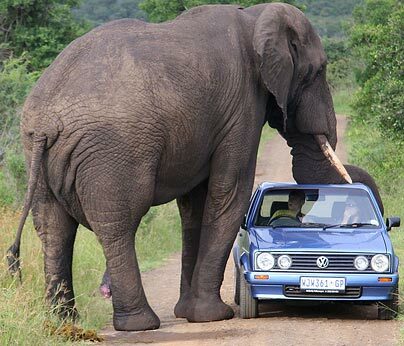 Rico Beltrame and his sister Angela, 29, were visiting the Hluhluwe Umfolozi nature reserve in South Africa in March when the incident occured.Driving through the park in their hired blue Mark 1 Volkswagen, the pair were left speechless when a huge African elephant stopped and put its foot on their hired car. via Elephant Incident | DeClubz – The Weird and Bizarre Blog.